Myricas are hardy shrubs grown primarily for their ornamental value, members of the family Myricaceae. Varieties are native to areas across the northern hemisphere. They have a rounded growth habit, leathery leaves and bear berries, sometimes blue or red, which are used for a variety of applications. The shrubs are nitrogen fixing, adding nitrogen to the soil. They make excellent border, specimen or landscaping plants as well as herbs. Most Myricas prefer a slightly acidic soils, but M. pennsylvanica does well in heavy clay. They thrive in full sun, although a partially shaded location with 6-7 hours a day of sunlight will work. Propagation is easily done by sowing seed, taking cuttings, layering or air layering. The seeds are coated with a natural wax which is best removed prior to sowing. This can be done by scarifying the seed (see Hot Water Scarification below). Stored seed should also be cold stratified for 90 days beofre sowing for best germination. See Cold Stratification Tips. Softwood cuttings should be taken late summer or early fall and inserted into packed sand and peat, which should then be kept moist until rooting. 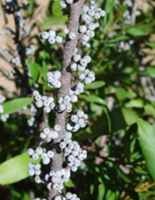 The wax on Myrica berries is very fragrant and is used frequently to manufacture candles. Herbal uses are listed below by variety. A medium sized deciduous shrub with fragrant blooms, maturing into blue berries, and small oval leaves. Good for use as a hedge or landscape shrub, it can tolerate windy areas in dappled shade. The berries and leaves are edible and are used as a substitute for bay leaves, or made into a fragrant tea. Medicinally, the bark is used to increase circulation and as an antibacterial in the treatment of colds, flu, jaundice, fever, sore throat and dandruff. The waxy coating on the seeds is used in the making of candles. Hardy to -10F (-23.3C); Full sun or partial shade; height: 10ft. Extremely hardy variety, native to North America and well adapted to poor dry soil in exposed locations. Although deciduous, the aromatic leaves usually remain on the shrub well into the winter. Fruits are covered in greyish wax used to make candles and hang on throughout the winter. The shrubs spread by means of suckers and can form hedges. This variety also stands salt spray very well and does well in poor sandy soilsl. Medicinally, the roots of this type are emetic. Plants reach maturity in 5 to 7 years. Native of China and Japan, this hardy shrub grows to about 15ft in height and is evergreen. The berries on this variety are red and are edible, cooked or raw, but do not last long. Medicinally, the berries are used to treat skin ailments and wounds, and in the treatment of heart ailments and cholera. A yellow dye is extracted from the bark. Good landscape plant. involves placing seeds in water that is 170 to 210 degrees F. not boiling. After the water cools, seeds should continue to soak for 12 to 24 hours. Use 10-20 times the volume of hot water as seed. Seeds with a waxy coating, such as myrica, should be washed several times in very hot water to remove the wax before the final soaking.